I'm sorry for all unanswered mails, myspace messages/comments and all other contact attempts by members from this site and I don't really have an excuse - just absolute, already close to insanity kind of laziness! ...I thought it's time to drop in a message again! I hope all those who'll go will have a great time at Wasted (don't forget to pack in the sun cream) and that the Earthbound-weekers will be as happy as I would be if I'd see the wonderful Boys sharing a stage with the none the less wonderful well-I-don't-have-to-mention-the-name-of-the-great-man-here-do-i- (in other words: extremely happy). 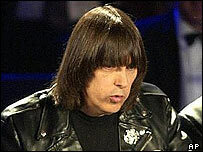 Johnny Ramone, guitarist in punk band The Ramones, has died at the age of 55 following a long fight against cancer. He passed away at his Los Angeles home on Wednesday afternoon, surrounded by his friends and family, his publicist confirmed. Ramone, whose real name was John Cummings, had been battling prostate cancer for five years. He will be cremated at a private service on Thursday, and a public tribute is being organised. Johnny Ramone is the third member of the seminal band to die in the past few years, leaving Tommy Ramone as the only surviving member of the original line-up. Singer Joey Ramone, whose real name was Jeff Hyman, died in 2001 from lymphatic cancer. Bass player Dee Dee Ramone, real name Douglas Colvin, died of a drug overdose the following year. News of Johnny's cancer fight emerged in June when he was admitted to the Cedars-Sinai Hospital in Los Angeles for an infection related to the illness. There was optimism that he would recover after beginning an experimental therapy treatment. He died in his sleep during Wednesday afternoon. Among those at his bedside were his wife Linda Cummings and friends Eddie and Jill Vedder and Rob and Sherrie Zombie. Also there for his final moments were Lisa Marie Presley, actress Talia Shire, director Vincent Gallo and musician Pete Yorn. A cancer research fundraiser was held on Sunday to mark The Ramones 30th anniversary, with performances from the Red Hot Chili Peppers and Henry Rollins. During the gig a letter written by Johnny was read out to the crowd by host Rob Zombie, who then telephoned him at his home live on stage. Johnny had been working on his memoirs with the aid of Washington Post reporter Steve Miller, telling of his experiences being in one of history's most influential rock bands. The Ramones, who had hits with I Wanna Be Sedated and Blitzkrieg Bop, were inducted into the Rock and Roll Hall of Fame in 2002. The band formed in 1974, with all the members taking the Ramone surname, quickly building up a cult following. Although they were never commercially successful, their unique sound helped shape rock music and are often cited as inspirations to new generations of musicians. Who's going? Any plans so far? Do you think it is necessary to buy a ticket for the gig or will there be one available at the door? Because I still don't own a credit card... :? but I'm afraid that this is impossible, isn't it??? ... so who will be where? Any chances of a meeting??? sooner or later i will send some photos of some german tuts i've made during the last tour to klaus (kaenga, loki, sloopy, uli and js) - any objections arising NOW OR NEVER!